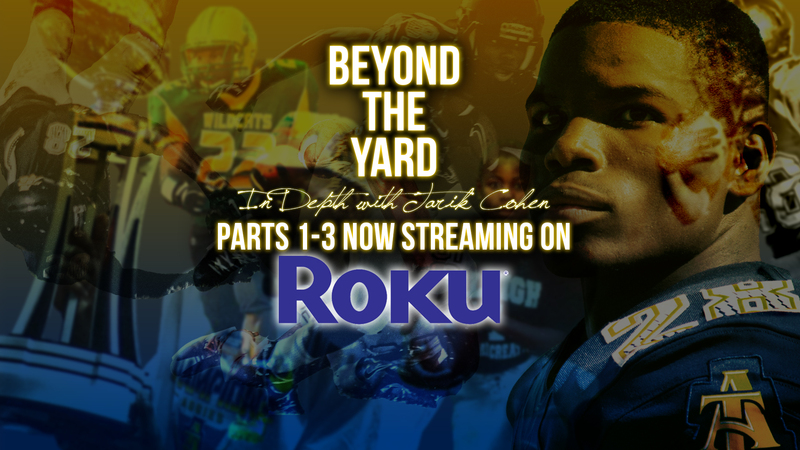 Beyond the Yard: In Depth with Tarik Cohen parts 1-3 are now streaming on the HBCU Gameday Roku Channel. The documentary series is presented by HBCU Gameday and HBCU Live and was shot and edited by filmmaker Wali Pitt. Beyond the Yard takes us behind the curtain to get to know more about HBCU Legend and former North Carolina A&T running back Tarik Cohen. We get to know his family, hear about his early playing days, and travel to his high school football field in Bunn, NC for this comprehensive docu-series brought to you with the style and perspective that you can only get from HBCU Gameday. Keep an eye out for an exclusive to Roku trailer at the end of part 3 for the series finale set to premiere in August. Tarik Cohen gets Que Love in the endzone at GHOE 2016.